Designed by Henri Mignet, the “Pou-du-Ciel” was the result of a long quest for a safe aeroplane that could be built quickly and cheaply by any amateur. 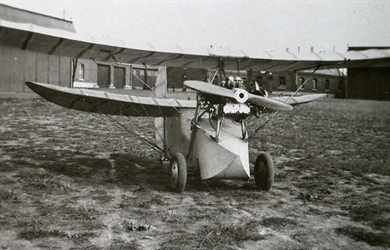 Mignet thought difficult to use both hands and feets to handle an aeroplane and continue to built and try aeroplanes of his own creations till the HM-14 in 1933. 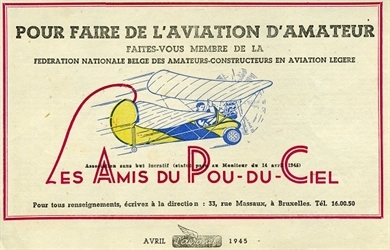 Once again, a book called « Le Sport de l’Air » was published and was an immediate success as hundreds of "Poux" were built. After his journey in England in 1935 and the translation of his book by the Air League, the rising world of aircraft amateurs became really crazy. Unfortunately, several crashes led to a total ban in several countries. Investigations of its aerodynamics characteristics were tested in Meudon’s wind tunnel and corrections proposed by Mignet. Nevertheless, the reputation subsists till now that the Pou-du-Ciel remains a dangerous aircraft even if it is not the case anymore ! Today, many amateurs built the HM-14 as an ultralight. Through his vision, Henri Mignet helped to launch the development of organised homebuilding movements across the world and is often called the « Saint Patron ». B.A.P.A. examplar : Come from the south of France. Private collection on loan. Powered with an ABC Scorpion II. In restoration at the workshop.